Skiers seeking an individual chalet in the heart of Courchevel 1850 will be as delighted as we at are with Chalet Elan, tucked away in a quiet cul de sac, with superb ski access. The Chalet Elan has an enviable location just 70m from a green run, so even beginners will be able to ski from the door within days. This green run leads to the Plantrey lift whisking skiers above the main lift system at La Croisette, thus avoiding the busy resort centre. The chalet Elan benefits from an inviting large lounge and dining area with country character features such as the beamed ceiling, a striking log fireplace and slate floors. The generously sized, comfortable bedrooms with warm wood panelling are spread over two floors, all with en suite facilities. The renowned après-ski of Courchevel 1850 is an easy 5-7 minutes’ stroll away in the resort centre and must certainly be experienced at least once during your stay! The owners live on the upper two floors of the building, sharing the main entrance to the chalet with our guests. Two separate rooms: a double room and a small bunk room (offset bunk beds) sharing shower/wc. We update Chalet Elan's details often, but facilities do change. e.g. some extras listed by the supplier as "free" or included might only be for the first time you use them, or for one time per party, then charged for further use. If any specific feature is essential to your holiday, make sure you ask us to confirm the details of it before you book your holiday. Courchevel lift pass price last reported as €218 (adult 6 day). Ask for a quote when booking Chalet Elan. 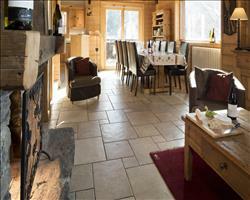 Chalet Samuel Courchevel France, Gatwick to Grenoble 11th January. 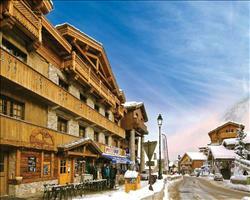 Chalet Le Mazot Courchevel France, Gatwick to Chambéry 15th December. 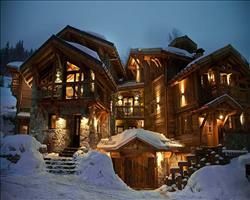 Chalet Premier de... Courchevel France, Gatwick to Chambéry 15th December. Darkoum Lama Courchevel France, Gatwick to Geneva 19th April. 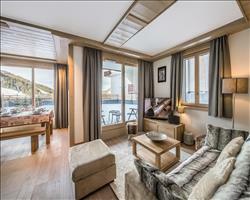 Chalet Cascades Courchevel France, Gatwick to Chambéry 15th December. 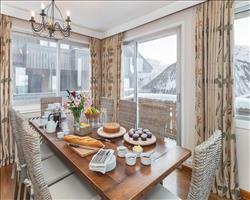 Chalet Le Bonheur Courchevel France, Gatwick to Chambéry 15th December. 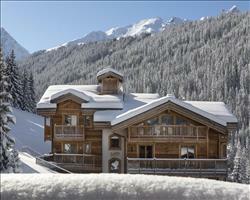 Chalet Eterlou Courchevel France, Gatwick to Chambéry 15th December. Chalet La Terrasse Courchevel France, Gatwick to Chambéry 15th December. 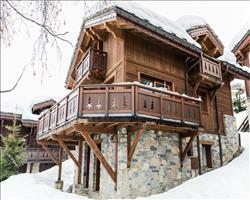 Chalet Le Notus Courchevel France, Gatwick to Chambéry 15th December. On the whole, the chalet was well appointed, handy for the slopes with skiing more or less to and from the door. The food was very pleasant. Wifi a bit iffy – you had to be really near the router to get a good enough signal which was a bit of a hassle. The snow was good for March – 1 afternoon we had complete fog in Meribel, I was unable to see 4/5 yards but otherwise the weather was fine. The chalet is lovely: not posh and a bit worn out but perfectly adequate. For breakfast we had juices, croissants and the usual English breakfast with bacon, sausages and beans. Beautiful cakes were left out for afternoon tea that we could help ourselves to. Evening meals were varied but all brilliant with a different meat each day and fish one day – all very nicely cooked and presented. The girls who ran the chalet couldn’t do enough for you. The chalet’s literally a minute walk to the slopes which was great; from there we could ski down to the gondola. My bedroom was fine, it wasn’t cleaned one day (not the host’s day off) but this wasn’t an issue, I have no complaints. It’s a lovely chalet. Much better than some I’ve stayed at on ski holidays. I was very happy with it. It’s right on the slopes, the location couldn’t be better for skiing. To get into Courchevel 1850 you have to walk uphill – there is a short cut through the snow or you can walk along the path next to the main road. You could take the bus down to 1650 as well which we did for our one meal out, there are buses running constantly and they run in the evening. It was better to be up in 1850 though as it was late in the season so the snow was better higher up. The hosts were wonderful, I don’t have one bad word to say about them. They were helpful and good fun. The food was lovely. It was high quality, and the desserts were to die for! I think I had about 4 panna cottas one evening… One thing to note is that they are quite strict about children having an earlier meal time at 5:30pm. We travelled together with another couple and it restricted them having a beer after skiing. One of them always had to leave the post ski drinks early to take the children back for dinner. One night we phoned the chalet staff and told them we were coming back later, and they ended up holding off the children’s meal and the children ate at 6:30pm, so they were accommodating, but they normally insist children always eat at 5:30pm. 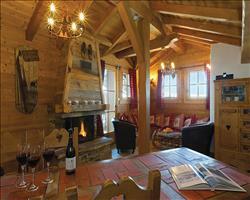 It’s not a luxury place, but good value and certainly good quality for a ski chalet. 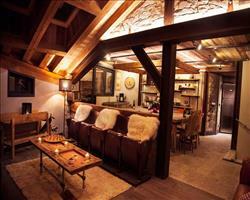 "If you go to Courchevel make sure you go to this chalet"
It was fantastic! Thoroughly, thoroughly recommended. The staff were great. They were super helpful – they negotiated with the ski school and helped us get a different instructor for our daughter, and they also took us to the ski hire shop in a jeep (which we had booked privately… and when we forgot our boots they even went back to get them). They were great with the children and they catered well for them. My daughter is a fussy eater and she was trying things she never normally tries. The food was amazing. The official children’s meal time was a bit early for us as we like a few après ski drinks, but they were very accommodating, we just called them up and let them know we wanted the children to eat a bit later. This wasn’t a problem as we were often skiing together with the other children in the chalet. When we got back they greeted us with a wee aperitif and canapés. The chalet is in a brilliant location. You can ski right back to it, and it’s only a short walk in the mornings, about 2 minutes. It’s great for beginners and families because there are lots of green runs nearby, although it’s great for everyone really. There was also a couple at the chalet while we were there and they loved it too. My husband could ski over to Meribel and there were some harder runs for him. I would love to come back. If you go to Courchevel make sure you go to this chalet! We took the free shuttle bus down to Courchevel 1650 one evening for dinner, on the chalet hosts’ night off, and we went to a restaurant on their recommendation, it was very good. I prefer Courchevel 1850 though because the shops are better and the pistes are nicer, so I would want to stay here if we came back. "Peaceful spot out of centre near lift"
This country style chalet is hidden away from the resort centre in a quiet cul du sac yet its handily placed right next to the Plantrey ski lift where, with a little planning, you're bound to beat the crowds and be the first to hit the slopes. 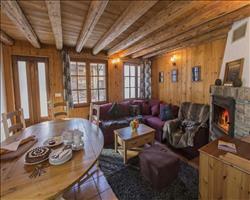 After a long days skiing’s the chalet has a cosy lounge with open log fire place. We love to be wined and dined at the end of the day with free flowing plonk over dinner, and this chalet comes up trumps with a better than expected wine selection and hearty catering worthy of the hardest charging snowboarders and skiers. Fuel for the body and the soul.